Chestnut Ridge, NY (August 14, 2017) – MC² (“MC-squared”), an exhibit, event and environment design and production agency, has earned a top award from the 14th Annual International Business Awards. Gold, Silver, and Bronze Stevie winners in several categories were selected from a record total of more than 3,900 nominations received from organizations and individuals worldwide. MC2 was recognized with a Silver Stevie® Award - Best Brand Experience Event – Americas in the Live Events Awards category for Toyota at the 2016 Environmental Media Awards. 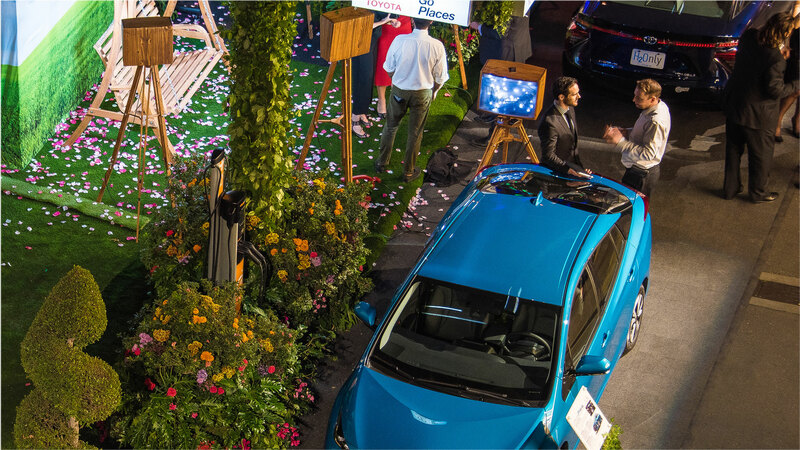 For the 2016 Environmental Media Awards, which was held on the streets of Warner Brothers studio, Toyota turned to MC² to create an engaging brand experience and showcase of Toyota’s line of eco-friendly vehicles. From concept to execution, MC2 transformed a “gas station” into a lush park where guests could “fuel up” with a natural experience that touched all of the senses. While the space featured familiar structures of a traditional gas station, natural greenery and the scents of freshly cut grass and flowers helped transform the station into a lush, beautiful park. The large overhead structure and its pillars were overgrown with real foliage, large flowering plants were placed throughout the space, and gas pumps were replaced with a Hydrogen fuel dispenser for the Mirai and a ChargePoint charging kiosk for the Prius Prime. The vehicles were parked in front of their respective pumps where guests could get a closer look from the inside out. Product specialists were on hand to answer questions about the cars and identify guests for the white-glove, Mirai VIP Test Drive program (which is managed by MC2). The International Business Awards are the world’s premier business awards program. Nicknamed the Stevies for the Greek word for “crowned,” the awards recognize individuals and organizations – public and private, for-profit and non-profit, large and small – from more than 60 nations and territories. MC2 ("MC-squared") is a leader in the exhibit and event marketing industry. Since 1999, the company has developed into a leading force at trade shows, corporate events and in building permanent branded environments. The company provides and manages integrated marketing programs, creating experiences where people meet people. Some of the world’s largest brands such as Canon, Samsung, Caterpillar, General Electric, Toyota, Motorola, Bloomberg, Volvo and 350 others seek their expertise and partnership. MC2 is headquartered in Chestnut Ridge, New York and employs a wide range of face-to-face marketing professionals in 15 locations in the U.S. and Germany.